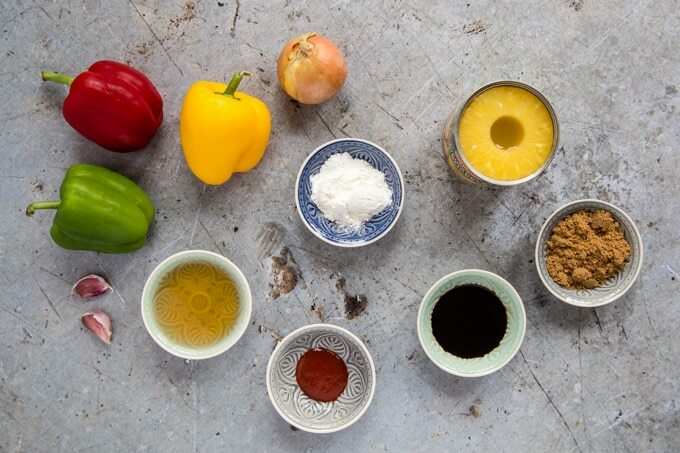 Homemade easy sweet & sour sauce looks superb, tastes great – much better than take-away or jarred sauces – and takes only a few minutes to make. It’s so versatile: use it with vegetable and meat dishes for a winning fakeaway meal. 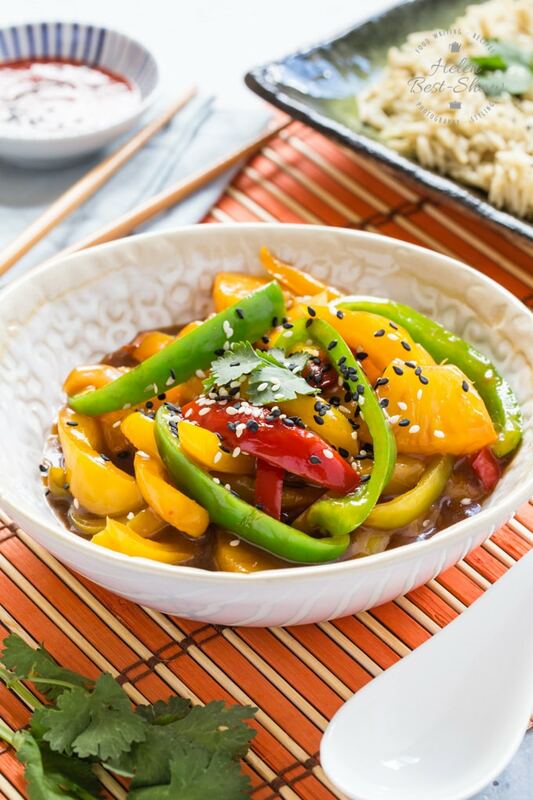 We have made this dish with peppers, but it is just as easy to use meat or other vegetables. How Can I Use Easy Sweet and Sour Sauce? This dish is quick and easy to make and can be ready faster than a takeout will arrive. It’s so versatile! See below for some serving ideas. It has no nasties such as artificial colours, flavours, preservatives or MSG. This means the sauce isn’t a lurid orange colour but I’d rather only have the natural ingredients. All sorts of ways! Here are a few of my favourite ideas. We made this dish with mixed peppers, as that is what we had to hand, but mix it up! As the basis for a veg-based side dish. 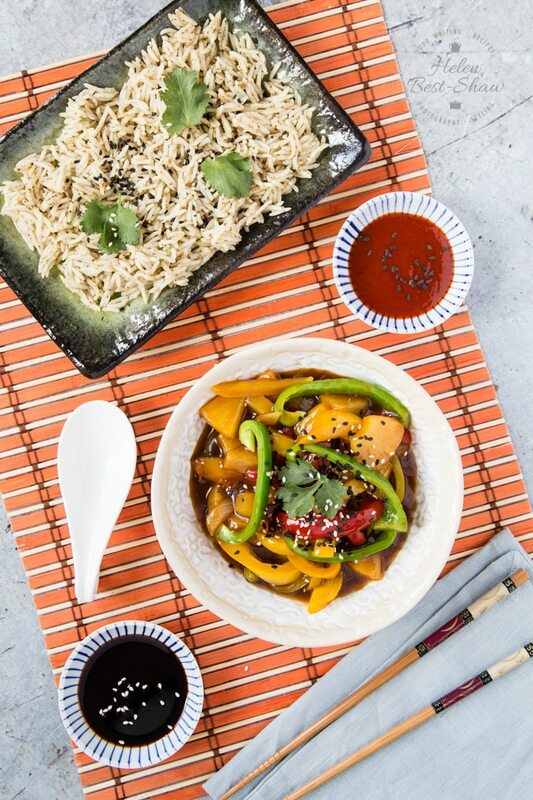 I’m always looking to add extra vegetable to my meals; as shown here, a dish like this easy sweet and sour sauce with peppers and pineapple is a great way to do this. As a dipping sauce for home made pot stickers/goyza, chicken bites or spring rolls. Perfect for a night enjoying a box set on the TV. To make my own sweet and sour prawns, pork or chicken, exactly tailored to how I like it? Extra sour? A dash more chili heat? Easy! Use it as a glaze when barbecuing. 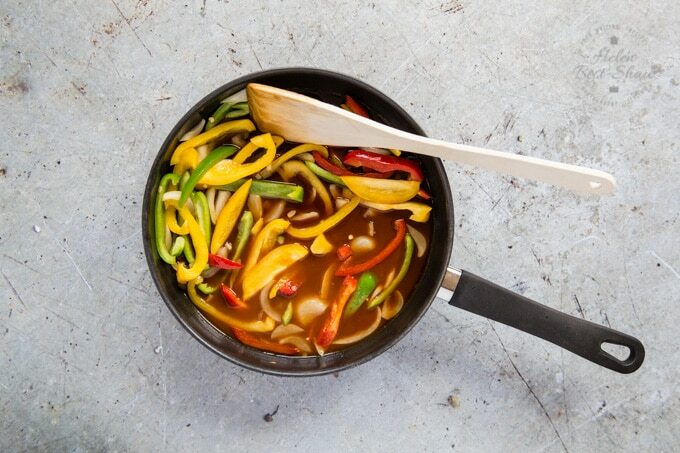 What are your favourite uses for sweet and sour sauce? Share your thoughts in the comments below. 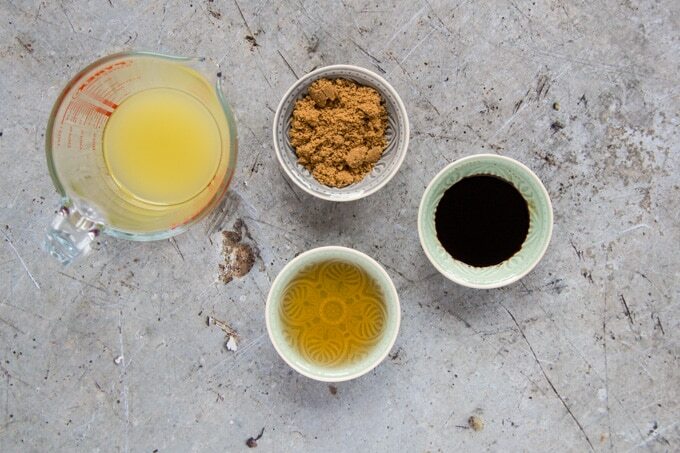 First – Measure out your ingredients. Second – Cut the onion, peppers, and garlic. Cut the peppers into strips. Third – Pour the pineapple juice from the can into a jug, cut the pineapple up into bite sized chunks. 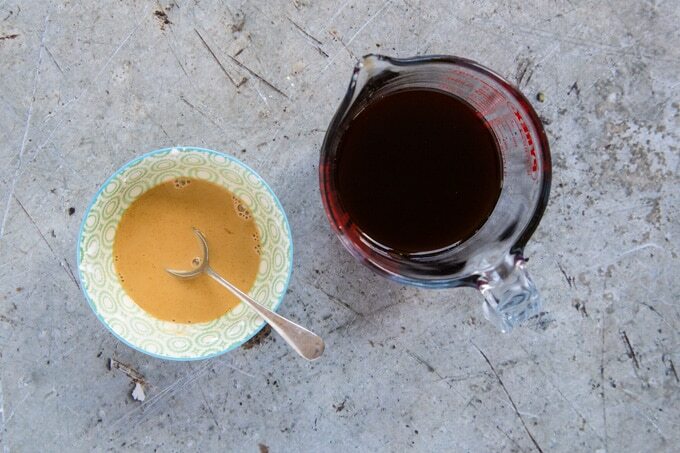 Mix in the white wine vinegar, soy sauce and brown sugar to the juice. Stir to dissolve the sugar. Fourth – Put the cornstarch in a small bowl and add a spoon of the pineapple liquid. Stir well and set to one side. Our top tip for thickening sauces with cornstarch – cornflour is an amazing thickener but you need to use it correctly to avoid lumps. Always add the liquid to the cornflour, stir to make a paste, then add the paste to the dish. As it is cooked the cloudy liquid will thicken and turn clear. 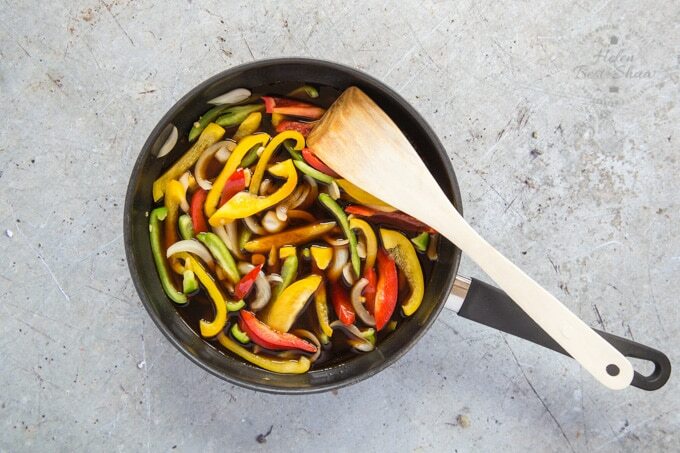 Fourth – Fry the onion, garlic, peppers in a frying pan in a little oil. When they’ve started to soften, add the pineapple juice. Fifth – Then add the cornstarch paste and cook some more stirring all the time. The sauce should quickly thicken. 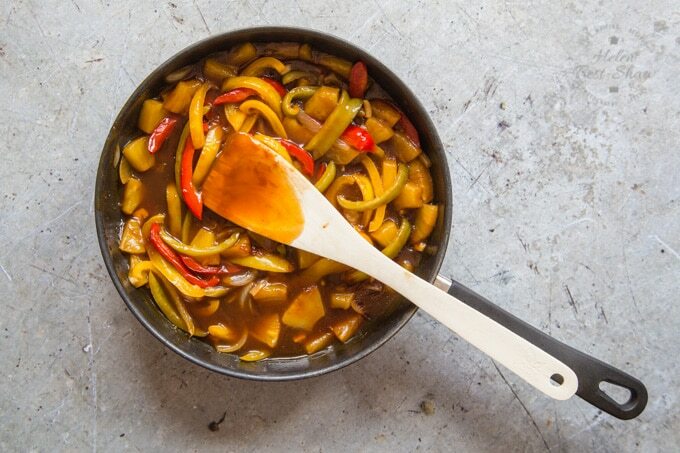 Sixth – When the peppers have cooked a little more, add the pineapple chunks and chili sauce. Finally – When the pineapple has warmed through, it’s ready to serve. 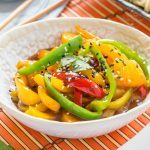 Easy Chinese style sweet and sour sauce fakeaway! If you have another can of pineapple then try my easy pineapple upside-down cake – only four ingredients and vegan and fat free! If you try this Easy Sweet and Sour Sauce please tag #FussFreeFlavours on Instagram or Twitter. It is amazing for me when for me when you make one of my recipes and I really do love to see them. You can also share it on my Facebook page. Please pin this recipe to Pinterest too! Thanks for reading Fuss Free Flavours! 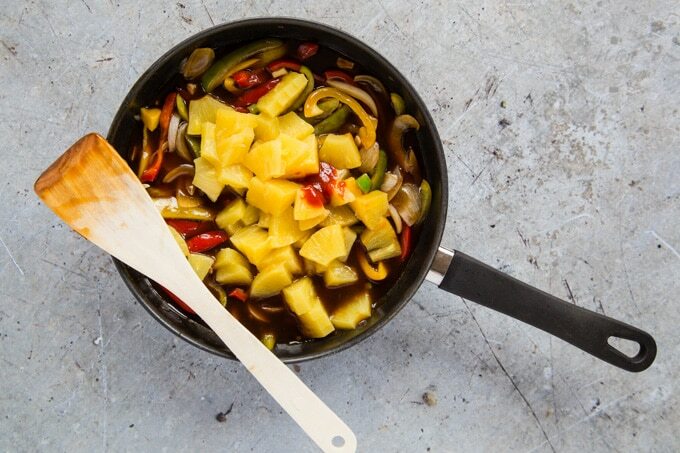 Easy Sweet and Sour Sauce with Pepper and Pineapple. Homemade sweet & sour sauce looks superb, tastes great - much better than take-away or jarred sauces - and takes only a few minutes to make. It's so versatile: use it with vegetable and meat dishes for a winning fakeaway meal. Peel the onion and garlic and chop. 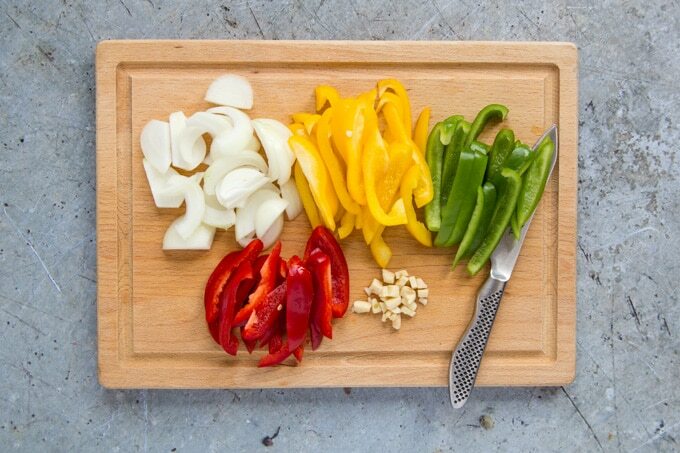 Cut the peppers into strips, discard the seeds and membranes. Pour the pineapple juice from the can into a jug. Mix in the white wine vinegar, soy sauce and brown sugar to the juice. Stir to dissolve the sugar. If using pineapple rings cut into bite sized chunks. Put the cornstarch in a small bowl and add a spoon of the pineapple liquid. Stir well and set to one side. Fry the onions, garlic and peppers in a frying pan in a little oil. When they’ve started to soften, add the pineapple juice mixture. Then add the cornstarch paste and cook some more stirring all the time. The sauce should quickly thicken to that characteristic takeout gloopiness. Add the pineapple chunks and chilli sauce and gently simmer until warmed through.